Our Faire Starter Pack is the perfect way to affordably dress for Renaissance Faires. It also makes a perfect bridesmaid dress for a Renaissance/Medieval themed wedding. One reversible Bavarian style bodice, black twill on one side and our choice of complimentary solid or brocade fabric on the reverse. The bodice is boned along the lacings. One natural colored short sleeved chemise/blouse in cotton. One cotton blend renaissance skirt in your choice of colors. Our Wench Starter Pack is perfect for hot faire days and provides a slimming silhouette. One reversible Wench style bodice, black twill on one side and our choice of complimentary solid or brocade fabric on the reverse. The bodice is boned along the back lacings. The Italian Overgown Starter Pack is perfect for the Faire Lady who seeks both comfort and beauty in a gown. The gown laces at the sides as well as the shoulders. The high waist and maximum adjustability make this a joy to wear. 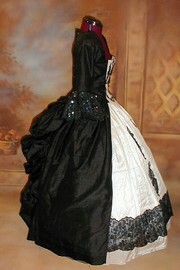 This package includes the overgown with a black bodice and your choice of skirt color, and one underdress in your shoice of color. Click on the picture to enlarge. Many of our projects are one of a kind, here is a gallery for inspiration!